When choosing a mattress to use with an adjustable bed (also known as a reclining bed) consumers can pick from a number of options. Each one differs in performance and function. The best choice for you will depend on a combination of how you plan to use your bed, the materials used to make the mattress, and its thickness. An adjustable bed base lifts the top and bottom of the mattress (the head and foot sections) between 40 and 70 degrees. This creates a more comfortable shape for you to read, watch TV, and even sleep. That means the most important thing to consider when choosing an adjustable mattress is its flexibility and durability. 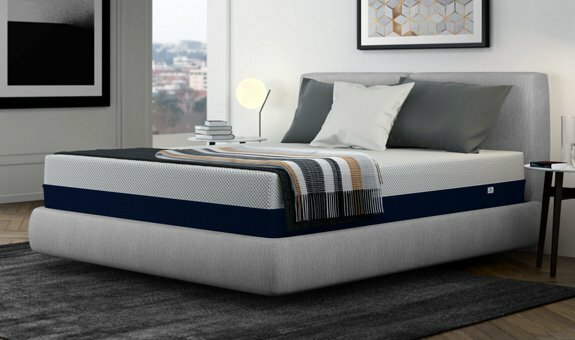 A mattress that’s best for adjustable beds will bend and flex to follow the contour of the base, while still maintaining its support and structural integrity. The four types most commonly paired with adjustable beds are memory foam, latex foam, innerspring, and airbeds. Memory foam and latex mattresses are usually the best choice to use with an adjustable bed. They are flexible enough to match the curves of the base, and if you pick a company that uses high-quality foam and materials, it will maintain its support and durability. However you should be aware that there are significant differences in construction among the manufacturers that make memory foam and latex mattresses. Try to find a company that uses the best, most modern materials. Otherwise you could wind up with a bed that’s uncomfortable and wears out quickly. Innersprings and airbeds can also be used on adjustable bases and reclining beds if necessary. They have a few issues shoppers should be aware of though, which we explain in this article. When it comes to comfort, durability, and support, memory foam mattresses are virtually flawless. They excel at relieving pressure and pain, and have also been shown to improve sleep quality. Memory foam conforms to your body shape and evenly supports your weight. That eliminates the common complaint of pressure points other mattresses have. When used with an adjustable bed, memory foam flexes easily to match the contour of the base without compromising comfort and support. Like memory foam mattresses, those made from latex are 100% foam and similarly effective at preventing pain and t points. However they have a different feel that is commonly described as “buoyant.” Because they are slightly more rigid, choose a thinner size so it can properly adapt to your adjustable base. Innerspring mattresses are most likely what your parents and grandparents slept on for most of their lives. Before the development of foam mattresses, they were the best kind available. Innersprings are made from coiled springs and a padded top, which makes them notably stiffer. Therefore they do not usually work well with a reclining bed or adjustable base. However some manufacturers make more flexible models to use in this situation. Innersprings are still fairly common because they can be cheaper than foam beds. The lower cost comes at the price of decreased performance, however. Innersprings are known for creating pressure points, having limited flexibility, and require more frequent replacement. Airbeds are made with one or more inner air chambers, and allow you to adjust their support by increasing or decreasing the air pressure. However only specific types are suitable for use with adjustable beds. Models with multiple chambers are usually fine. Just be aware that when the adjustable base bends, it can impede the airflow and reduce support. We don’t recommend using an airbed with a single chamber though, because they are almost always too rigid. The last thing you need to consider about the mattress you pair with your adjustable bed is its thickness. No matter how flexible the material, it can become too stiff if it gets thick enough. Depending on the mattress type, the ideal thickness is between 6” and 14”. The more rigid the material, the thinner the mattress should be. It should still be thick enough to provide a supportive night’s sleep, though. The most common thickness for foam mattresses on adjustable beds is 10”-12.” Our most popular models to use in this situation are the AS3 and AS2 beds. Now you know the four key things to consider when choosing a mattress for your adjustable bed: flexibility, durability, support, and thickness. If you’re going to use an innerspring or airbed, make sure that it’s designed for adjustable bases and reclining beds. Otherwise it may not work. On the other hand, memory foam mattresses like the ones from Amerisleep perform best on adjustable beds, with latex following in a close second. Depending on the mattress type, the ideal thickness is between 6” and 14”. The more rigid the material, the thinner the mattress should be. Find a combo that adjusts to your needs.